The latest Canadian census data shows the number of adult children living with their parents is on the rise again. As of 2016, 34.7% of adults aged 20 to 34 were living with their parents, up from 33.3% in 2011. But that number varies quite a lot across the country. In Ontario, 42.1% of adults in this age range live with their parents, and in Toronto specifically, nearly half do so: 47.4%. In Quebec, on the other hand, less than a quarter of 20-to-34-year-olds live at home. Twenty to 34 is a wide age range that includes university students all the way through established adults. Not surprisingly, more people in their early 20s live with their parents (62.6%) than do people in their early 30s (13.5%). The majority of those in their early 20s who were living with parents said they had never left home, where as most of those in their early 30s had left at some point and then returned. This entry was posted in General advice, News, Statistics on August 2, 2017 by Christina Newberry. It was a pleasure to appear this morning on the Global BC Morning News to talk about how to deal with adult children living at home. You can watch the entire segment below. This entry was posted in General advice, Media appearances, video on May 19, 2016 by Christina Newberry. A reporter is looking to speak with a parent or parents of boomerang kids to find out how they have made things work, financially and otherwise, for an article in an ongoing retirement series in a major Canadian daily newspaper. If you’re interested in sharing your experience, please email the reporter directly at gailjohnsonworks@gmail.com. This entry was posted in General advice on May 9, 2015 by Christina Newberry. I’m a huge advocate for adult children making a financial contribution to the household when they live at home (I explain why in this video), so it’s troublesome to see once again that so many parents have adult children living at home absolutely rent-free. This entry was posted in General advice on January 2, 2015 by Christina Newberry. If you know a family with adult children planning to move home in the new year, or where adult children are already living at home (and maybe things aren’t going as smoothly as everyone had hoped), you might be thinking about holiday gifts that could help return peace to the household. 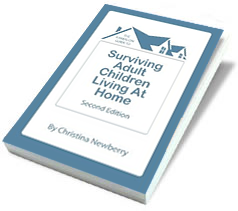 Since you’re reading this post, you may even have thought about giving a copy of The Hands-On Guide to Surviving Adult Children Living at Home. You may also be feeling some hesitation, unsure how your friends or loved ones will react to the gift. Will they appreciate it? Or will it get their hackles up if you suggest they may need some help? What I can tell you is that families who have implemented the advice in my book — and used the family contract template that’s part of the package to create a clear plan for their adult children’s stay at home — say that they have better relationships with their adult children, both during their stay at home and after they leave. Some parents have even told me the book has saved their marriage. What better gift is there than that? If you want something to wrap and put under the tree, you can get a paperback copy of the book from Amazon (in Canada, Amazon.ca). If you’ve left your gift shopping to the last minute, you can order the eBook for an instant last-minute gift. Both the eBook and the paperback come with the family contract template and a family budget calculator. This entry was posted in General advice on December 13, 2014 by Christina Newberry. Having your adult child living under your roof can have its challenges (and its rewards), but things can get more intense over the holidays, when family tensions tend to build. If you have an adult child living in your home (or are expecting one to stay with you over the holidays while visiting) the key thing you can do is sit down and talk about what the living situation will be, before your grown son or daughter comes in the door — or soon afterwards. You need to make sure you all agree about what’s acceptable, and a written agreement can be an great way to make sure you cover all the issues and everyone is on the same page. After all, the relationship between parents and their children is always a parent-kid relationship, with all that that entails, no matter how old the child is or how long they’ve been on their own. – Household rules, including swearing, late nights, and noise: Especially if your kids are coming home from college and is used to college-style language, music, and hours. Talk about what you’re comfortable with, and what you’re not. – Who covers additional expenses: If your adult kid is just home for the holidays, this probably isn’t an issue. But if they’re home for a month or more, who’s going to pay for the extra groceries they consume and the electricity they use? Remember that food bills especially can pile up over the holidays. – Which chores your grown kids will be responsible for: A Christmas break with no help from your adult kids could leave you fuming. Make sure you agree on what’s expected beforehand so your kid doesn’t feel imposed upon, and you don’t feel resentful. For more tips on keeping the peace — at any time of year — check our my 115-page eBook, contract template, and household expense calculator, all for only USD $27.97 now just $19.97 for the holidays for a limited time! This entry was posted in General advice on December 3, 2014 by Christina Newberry. I’m sorry, but Ottilie does not get to lay down these kinds of rules. She is an able-bodied adult living in her parents’ home completely rent-free. She absolutely should be a dogwalker – she just needs her mother to work up the nerve to tell her so. And she should be helping with the other chores, too. I know it is hard on an adult child’s self-esteem to sleep in a single bed. This is exactly what I did when I moved back in with my parents when I was going through a divorce. It was a difficult symbol to deal with, as it so clearly meant I was not operating in grown-up territory. But it would have been outrageous for me to ask may parents to buy new furniture to accommodate me, and it is outrageous that Daisy did exactly that for her daughter. An adult is absolutely capable of sleeping in a single bed! She may ask, but I sincerely hope Daisy never says yes, unless Ottilie is offering to help share the driving on a long trip. There is no reason an adult child can’t let you know when to expect them home. I’m not a fan of curfews, but I am a BIG fan of respecting the people you live with, and not causing them to worry about you. I just cannot understand why Daisy allows this. One of the most important factors when adults live together is that everyone has their own space. Those boundaries need to be established and respected. I cannot imagine ever having behaved in this way, even as a petulant teenager. To do so as an adult is inexcusable, and Daisy needs to tell Ottilie that. This post has gone on long enough, so I’ll end it there. But parents, please, remember that your home is your home. When your adult children move back in, you need to establish boundaries and outline your expectations so that everyone can live happily together. This entry was posted in Family stories, General advice on November 19, 2014 by Christina Newberry. A Vancouver, Canada production company wants to hear from Canadian parents of 20-something adults who have moved back home and are causing stress. They might be failing to pay rent or other expenses or do their share of the housework, not looking for work, making their parents uncomfortable by bringing home friends or partners, relying on their parents for free childcare, stealing, or dealing with substance abuse issues. All stories and names will be kept completely confidential. If interested, please send an email with a paragraph or two describing your situation to vancouverwritergirl@gmail.com. There is a potential for some assistance, financial or otherwise, to be offered at some point down the road in exchange for willingness to participate in this documentary-style TV series, but a response to this callout in no way obligates the respondent to participate. This entry was posted in General advice on August 15, 2014 by Christina Newberry. Can both generations benefit when adult children live at home? It’s true that when families plan ahead, have open communication, and all get on the same page about the expectations for the adult child’s stay at home, there can be benefits for both generations. The benefits for the adult children are obvious: parents provide ongoing support, both financial and emotional. And parents do get the companionship and affection Renzetti refers to. Even more important, they get a chance to really get to know their children as adults. The fact is that in most modern Western societies, we don’t make a lot of time for our parents once we are no longer under their roofs. Spending some time living together as adults changes the nature of the relationship between parents and their adult children, often with lasting results. Both generations get a chance to see each other as adults with real goals, dreams, and insights. Having the time to make those discoveries can be precious. Of course, it’s not always so wonderful. If parents and kids have different expectations about anything from who does the laundry to how much the adult child should contribute financially, there’s the potential for lasting effects on the relationship that lean toward disastrous rather than delightful. Real, open, honest communication is the most important factor in just about any relationship, and that’s especially true for parents and adult children who live together. This entry was posted in General advice on February 5, 2014 by Christina Newberry. So much of the stress in our lives is caused by relationship challenges that we either have not acknowledged to ourselves, or that we have not acknowledged to others. This is true for all relationships, whether it’s with a spouse, a friend, an aging parent, or an adult child. We fall into the trap of expecting others to read our minds, or believing that everyone has the same expectations we do. This leads to huge amounts of underlying frustration, resentment, and stress that seep into all areas of our lives. The worst part is that when we’re frustrated, angry, and resentful, we assume the worst of the people in our lives, rather than the best. That means when a challenge arises that we actually recognize as stressful, we are disinclined to give people the benefit of the doubt. We start to believe they are stressing us out on purpose, which escalates our frustration and resentment even further, so it’s a tough cycle to get out of! The most important way to eliminate the hidden stress in any relationship is open communication. We really do need to tell people how we feel, and address minor snags in relationships before they blow up into huge problems that become so common we don’t even recognize they’re there – even though they cause us stress daily. The challenge is that we don’t necessarily know how to have those tough conversations. That’s why one of the most rewarding messages I get from families who have used my book as a guide is that it helped them get those tough conversations started – and make them productive. I’ve had stressed-out parents (and step-parents) tell me the book has saved their marriages, since they’re finally able to really talk about how they’re feeling, and start building an atmosphere of open communication. May this new year bring you a new lease on all the difficult relationships in your life. Remember: Honesty may be difficult, but if you are clear, level-headed, fair, and reasonable, your openness will clear the path for much less stressful relationships all year long. All the best to you and your family in 2014! This entry was posted in General advice on December 30, 2013 by Christina Newberry. "This book was a life saver when one of my children moved back in, after being gone for 13 yrs. It gave me great and workable ideas, which I implimented and they worked. Once in place my angry was diffused and we had a great working relationship. This child stayed with us for 1 year and 10 months and just recently move out. All on good terms. :) Highly recomment!!!!!!!!! " "She offered clear and honest ideas for both parties to work on to make the stay as successful as possible. Christina Newberry hit on many important key points of having adult children living at home, such as the financial impact it has on parents nearing or at retirement, parents offering a comfortable environment with amenities so young adults are reluctant to leave, etc. It was very unbiased, so if parents are divided on how they feel, it has quite a fair outlook on the situation." "Bought your book online yesterday. Finished it today. Have reason for renewed hope on several fronts. Thank you. I think your message and your book are on the spot." "I found all of the information very helpful and may have just saved my relationship with my husband. I have set up a list of house rules that we all discussed and amended as we each saw fit and a weekly chore sheet. I have to say it is incredibly harmonious in our household since introducing the changes - long may it continue... Thank you once again." "Thanks for your sage advice on the show... You were terrific." "Very well thought out material that made it easy to create a starting point for conversation and problem solving." "I can't tell you how much we are appreciating your well though- out easy to use guidelines and contract agreement. "Keep up your great work. You are a godsend." "I'm a psychologist specializing in work with young adults and their families. I will definitely be referring people to your site, and will encourage them to get the book." "I sure like some of these rules!" "I found your information invaluable helping to put some boundaries and rules in place for when my adult child and his family move in. Some times when it is family it is very hard to step back and take an objective perspective of a family crisis like your child having problems and needing your help with out it making your relationship worse. After reading both your report and the book I feel equiped to make things alittle easier for both of us." "Just read a bit about your book--very timely and supportive to lots of moms enduring this transition. I'm Referring it!"